Someone once told that if you learn a new thing every day you will end up as the wisest man in the world. As we’ve discussed previously, (notably in relation to the dik-dik episode) there is a difference between knowledge and wisdom. It’s likely that you may end up as the most knowledgeable man in the world, but wisdom may still be beyond your grasp. Anyway, unless you are Stephen Fry or a quiz champion there isn’t necessarily any money in knowledge. Quite honestly, if the price of riches is becoming Stephen Fry I’m not sure the price is worth it. Same goes for quiz champions – I really don’t want to cram my head with sporting trivia and I’m quite happy with my patchy knowledge of the Kings and Queens of England. Having a few gaps in the list is a human failing I can endure, and knowing that Louis VIII of France was also briefly King of England (a fact overlooked by school history books) gives me a slight tingle of smugness. So what have you learned today Simon? I hear you ask, knowing full well I am setting you up for something. I have learnt the meaning of the word sempiternal. I take no pleasure in knowing it as I will probably never use the word, but will have to leave it on a mental shelf alongside rictus, jeremiad and obfuscate. All fine words but not really usable in 2015. It’s also a bit embarrassing because it’s used in T. S. Eliot’s Little Gidding (a poem I have read and a village I have visited) and I hadn’t bothered to look it up. That doesn’t look good for a man who likes words and learning things. However, I was a teenager and I have changed since then (perhaps even improved). Talking of T. S. Eliot, did you know that his name is an anagram for “toilets”? My father-in-law (who wrote light verse and had a reasonable facial resemblance to Eliot) never tired of pointing that out. In fairness to my father-in-law, who might be seen as coming off second best here in intellectual terms, his verse may not have attracted the critical acclaim of Eliot’s, but he did read on stage with a number of well-known performance poets and he did always put a smile on your face. On top of that, with my father-in-law, having been a physiotherapist all his life, was a sound man to consult if you had nagging joint pain. I’ve never felt that Eliot would have offered much comfort once the damp weather drew on and your knee started to creak. As for tomorrow’s learning – I need to find out how to grow coffee plants and why we need the word sempiternal when eternal looks like it will do the job just as well. Has anybody out there in hotter places grown coffee plants? This entry was posted in General and tagged physiotherapy, poetry, vocabulary on July 31, 2015 by quercuscommunity. I’ve now added another piece of foraged food to the list (and will be writing it up in the Wild Food section shortly. Day lily buds. We don’t have many lilies but after watching several school groups grab pieces for their nature bling activity I decided that I may as well have one. It was quite good. Fresh-tasting, a touch of onion and a flavour of something else I can’t quite place. I would, I thought, be happy to eat them again, particularly sauteed in butter or tempura style as often recommended. However, when I sat down to look at some websites I noticed as phenomenon I’d seen before. Before you eat something all the websites are glowing, positive and eager to tell you there’s no possibility of misidentification. After you eat it they are all more cautious. It’s a story much like the dahlia story – there are so many cultivars people are no longer sure what is edible and what isn’t – though in the case of dahlias this revolves around taste rather than possible side effects. We’re now bottle-feeding a kid. It won’t take a bottle so we’re using a tube at the moment. It seems to be perking up but I’ve learnt never to expect too much from these situations. That’s the best bit of being on the farm without being part of it so we can take the benefit of cute animals without the emotional investment of sitting up all night feeding them. I say “we” but I am absolutely brilliant at delegating. Or lazy, as my wife would have it. She still hasn’t forgiven me for the dik-dik incident. 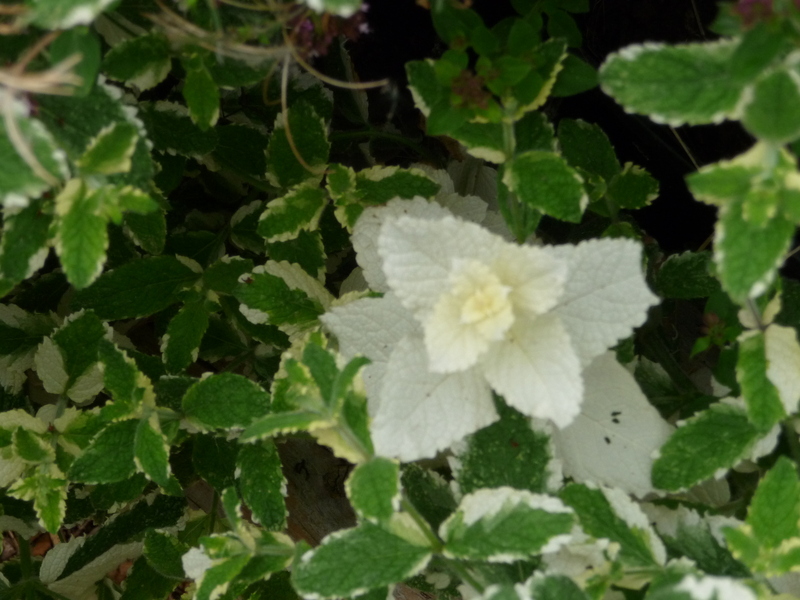 I spotted this unusual sprig of variegated mint while I was walking round with the camera. Can’t make up my mind whether to try and breed from it (in case anyone wants to grow anaemic mint in the garden) or leave it. So far I’ve left it. In due course I will probably read about a plantsman who is running an Aston Martin on the proceeds of breeding “Ghost Mint”. Then again, perhaps not. We’ve also viewed piglets, spotted butterflies, captured a mint moth and evicted it from the kitchen and, finally, given Tim (the Xmas Elf) his going-away card. He’s off to work in Europe, though at the moment he’s finishing cleaning up the bee equipment. This involves flame, scrapers and a cloud of wasps. The cloud of wasps isn’t strictly necessary but it came along anyway. 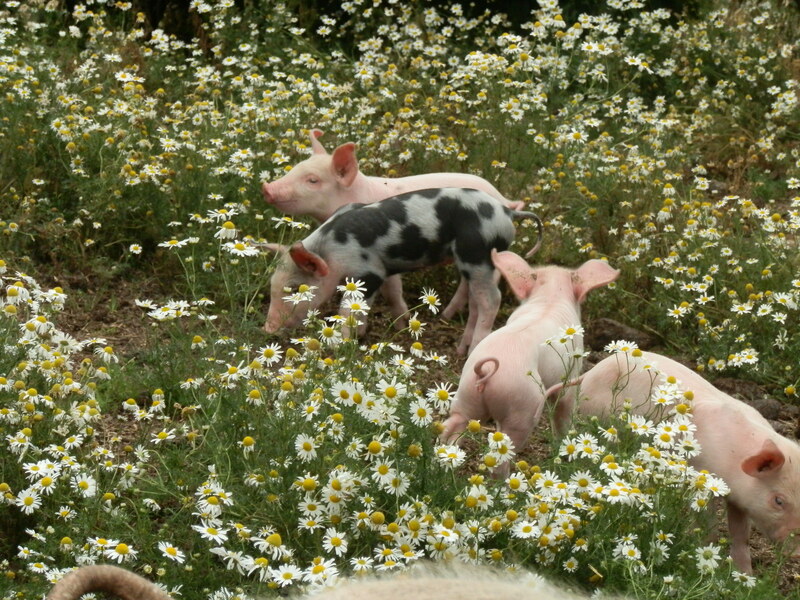 This entry was posted in Care Farm, Foraging and tagged bottle fed, day lily, foraging, goat, mint, piglet on July 29, 2015 by quercuscommunity. We have new goats! They are pictured above, though you may struggle to make them out. When we have new animals we always have plenty of people wanting to use the camera and we try not to hang around and disturb them too much. The result is half a dozen rushed photos from someone who may not have held a camera for months. 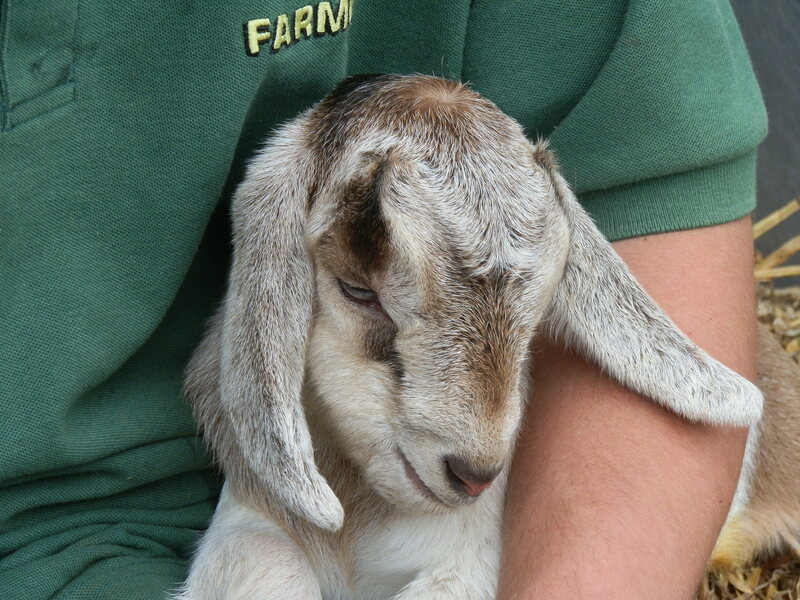 One kid isn’t eating so it’s a bit of a worry – we aren’t lucky with goats. Apart from that it’s been a busy morning with the apprentice trainer coming and a professor visiting – yes, professor. We’re not as daft as we may sound from this blog. 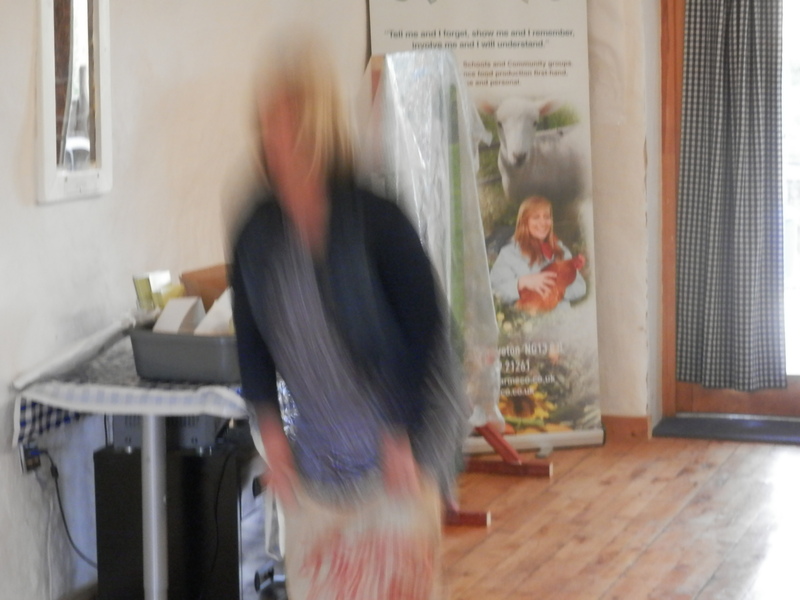 We’ve done eggs, looked at the new goat kids, gone through the list of jobs, struggled with technology (that was me) and taken pictures of butterflies (me again – it’s a hard life). Having said that, I’m still banned from playing hangman. I’m not happy with the decision because I feel it was quite an easy word and well within the spirit of the game (as It can be difficult pitching it right for the group) and generally not thought of as a “bad” word. Trouble is that I failed to take into account the fact that a couple of the group would go home laughing and telling everyone that there was an antelope called a dik-dik. I will say nothing more, just reflect that there is a difference between knowledge and wisdom. Knowledge is knowing there is an animal called a dik-dik. Wisdom is realising that when you work for your wife you need to remember she doesn’t always share your sense of humour. 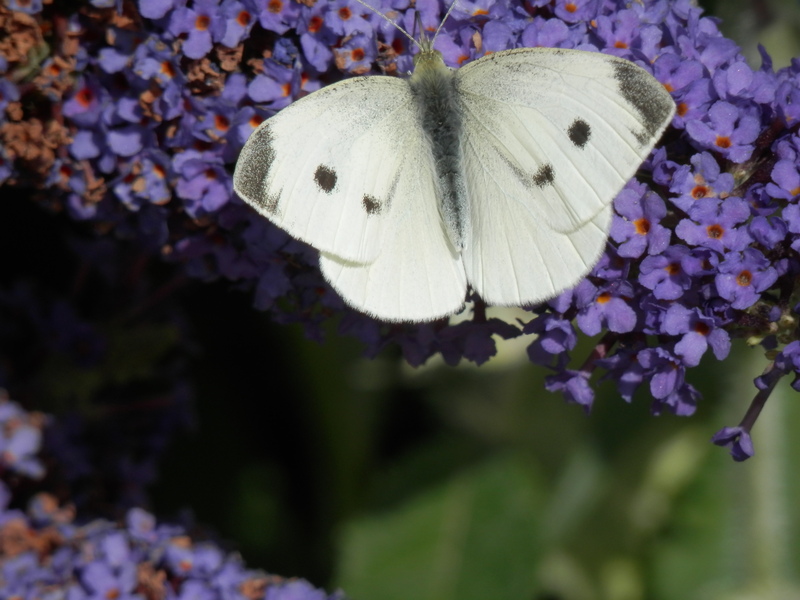 Meanwhile I have a good photograph of a female Small White, which is on my list of things to do. 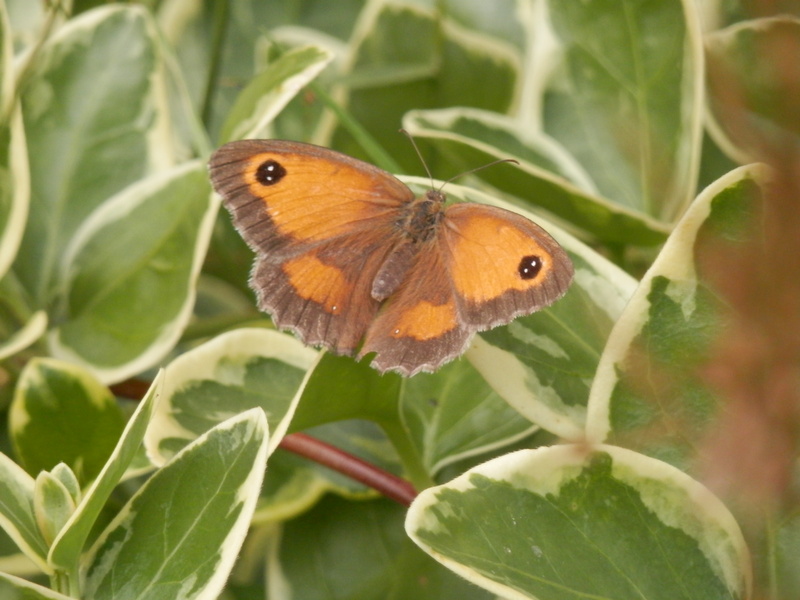 Also got a good photo of a Gatekeeper. Both of them have their wings open, which can be tricky to get. We’re making bath bombs with lavender from the garden at the moment, and then it will be time for lunch. Is it really only half-way through the day? This entry was posted in Care Farm and tagged butterflies, goats, hangman on July 29, 2015 by quercuscommunity. It’s been a hectic day of baking bugs. The bug hunt was a bust due to the weather – the only butterfly we saw was a Large White imitating a clipper under full sail as the wind whipped it past at a rapid rate. The hoverflies are still about and the larger types of bee are also getting to grips with the serious job of feeding. . They say (and I can’t vouch for this as it’s on the same internet that thinks Miley Cyrus is a celebrity) that a bumblebee with a full stomach has only enough energy to fly for 40 minutes and enough honey in the nest to last just a couple of days. You can see from this why they have to keep plugging away at it. I have enough energy to last several days, enough in my pantry to last several weeks and I don’t get lost when farmer’s spray neonicitinoids. Makes you realise how lucky you are. (Update: I just took a break from typing and spotted a Red Admiral in a sheltered nook of the garden. No photo as Julia has my camera.) Two butterflies in one August day – hard to believe. We have shaped silicone baking trays, we have icing, Smarties, red fondant, black fondant, cutters and coloured icing pens. We have cake mix, we have those hard shiny metallic balls and we have a dedicated team of bug builders. By mid-afternoon I confidently forecast that we will see several new species described in a mixture of cake and icing. Probably with fingerprints in the fondant and bite-shaped pieces missing round the edges. Yes, this has all the makings of a classic day on the farm. 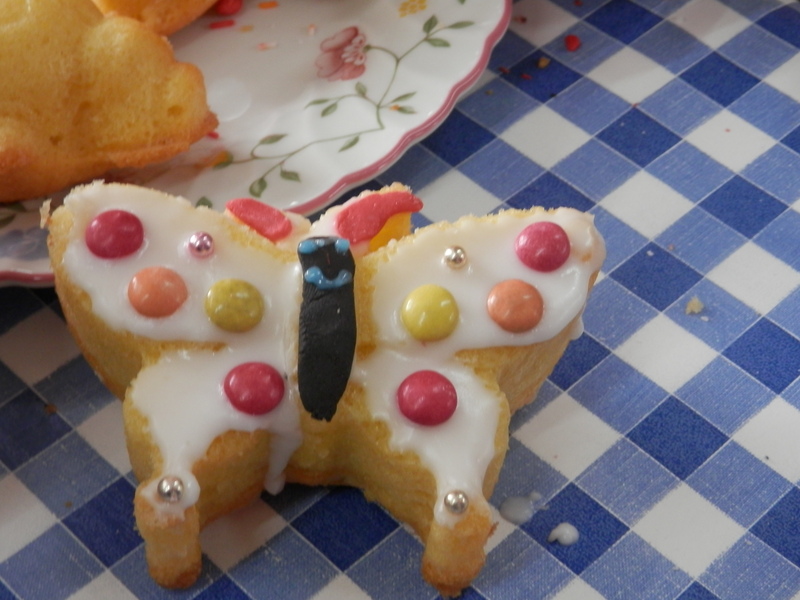 This entry was posted in Care Farm, Cookery and tagged baking, bees, icing, pollinators on July 28, 2015 by quercuscommunity. Well, it’s been an interesting day. One of our co-workers had a fit of tidying before we arrived and all sorts of things were randomly repositioned to fit her mental map of “tidiness”. Still, there’s no point being downhearted, even if you are locked into a turf war about a second-hand desk, and the devil makes work for idle hands. 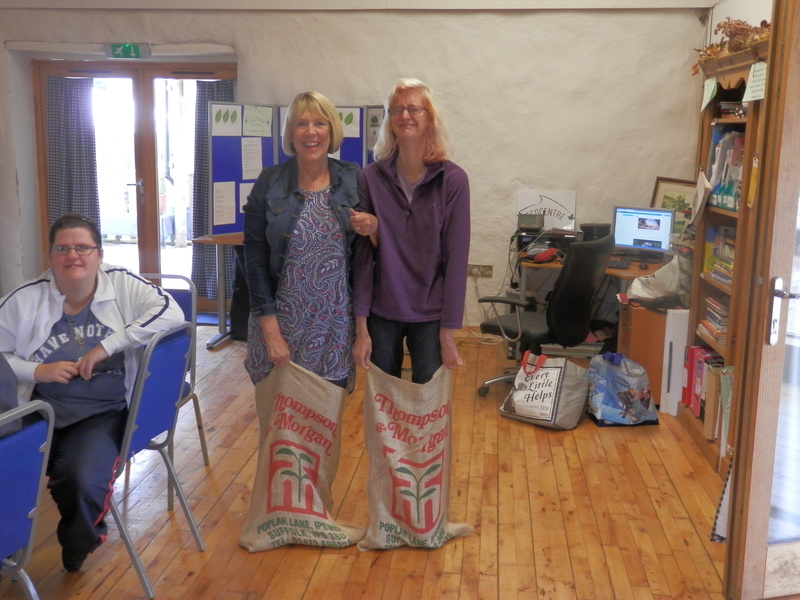 Having taken delivery of a number of potato sacks from Thompson and Morgan we quite clearly had to hold a sack race. Well, “clearly” is probably overstating things, but it seemed like a good idea. As you can see from the photo the race was fast and furious and finished without injury. With the T&M sign looking like a sponsorship logo I’m thinking of putting a bid together to see if they fancy sponsoring a semi-pro sack racing league. Then we had a man knock on the door with a couple of members of his family and ask if they could use the toilet. I said yes, though I was slightly perplexed at why we’ve suddenly become a noted public toilet. It seems that they had been travelling from the Midlands to Skegness and needed a toilet – reference to the internet had produced us a solution. Then I found that it wasn’t just his family but two minibuses of people with special needs and their helpers – 38 in all. Try explaining the workings of a waterless toilet to 38 people who aren’t listening because they have their legs crossed! When I went to take a picture of the “accidental permaculture bed” to use on the Wild Food page I found that the Fat Hen has disappeared from the bed, leaving just rocket and beans. We can cancel the foraged fat Hen soup I was going to make tomorrow as I won’t be able to find enough. I suspect somebody pointed out it was a weed at the weekend and that was the same as a death sentence the way things are around here at the moment. I have a picture of the desolate former accidental permaculture bed, but it’s too depressing. Instead I’ll ask if anyone can help me identify the red-bottomed bumble bee in the top image. 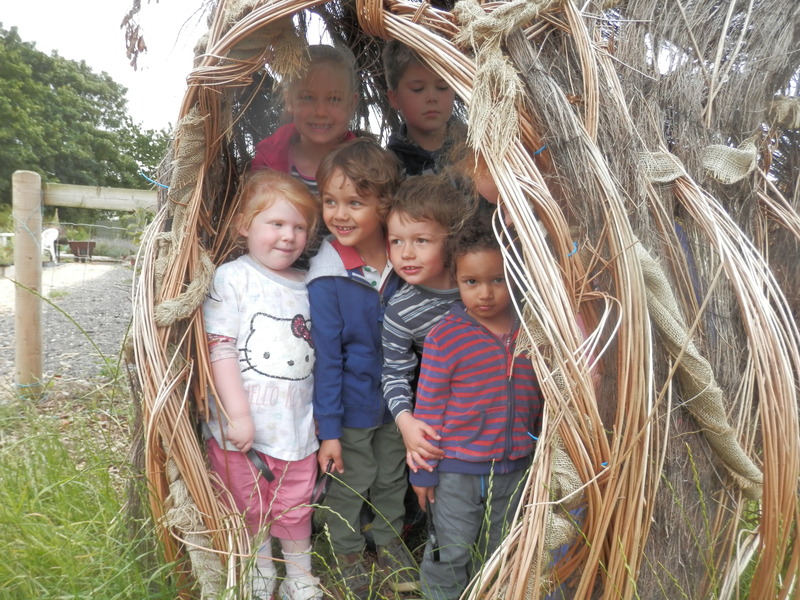 We have a nest of them somewhere on the farm – can’t say where as it might go the same way as the permaculture bed. If anyone knows what the moth in the picture is I’d be grateful if you can tell me. Sorry it isn’t a better photograph. Finally we had a run-in with the newly repaired alarm. Five attempts! And that’s how we get to the title – It is a tale, told by an idiot, full of sound and fury, signifying nothing. Would make a good title for the film of my life. 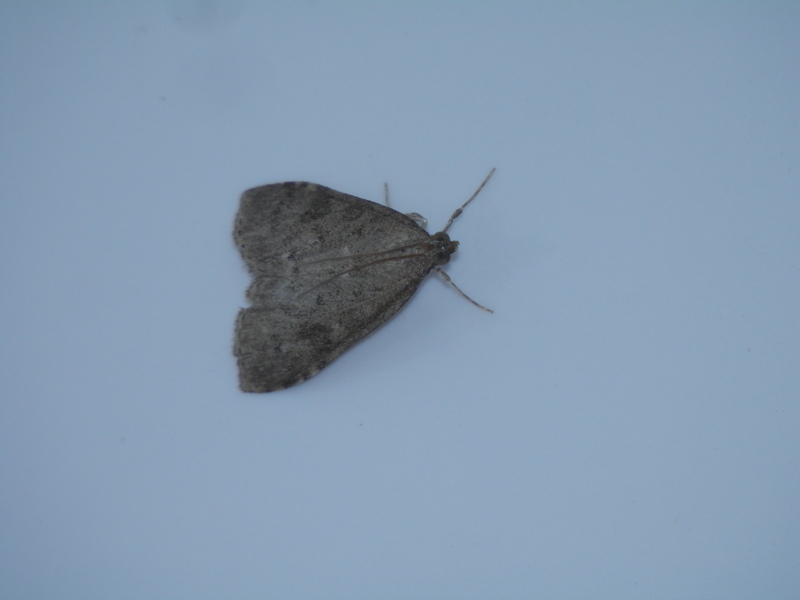 This entry was posted in Care Farm and tagged bumble bees, foraging, moth on July 27, 2015 by quercuscommunity. It’s been overcast most of the day. When it hasn’t been overcast it’s been raining. As a result there’s been a distinct lack of butterflies, though some of the other pollinators have been doing their best. The bumble bees and hover flies have been out in force despite the lack of sun. This bee, for instance, has not only been working hard but demonstrates why bumble bees make better pollinators. I’ve just edited the post to make the photo bigger – hopefully the pollen grains are now visible – there’s a lot of pollen on that bee! The only butterfly/moth type of thing II saw were two refugees in the toilets. I suspect they had found their way in last night and had nothing better to do. One is an indistinct grey-brown that I’m still in the process of identifying, the other is pictured here. 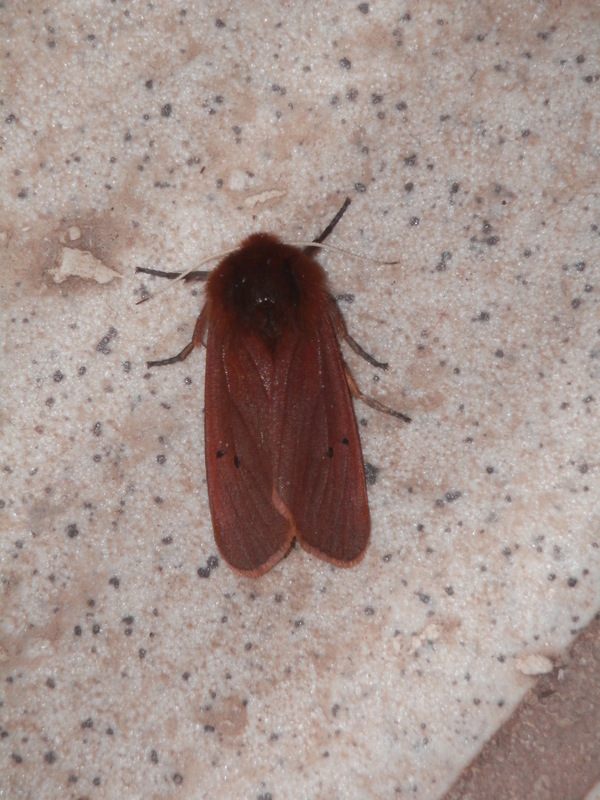 It seems that the name Ruby Tiger Moth is more applicable to southern specimens, as they are much redder in the south, getting duller in colour as you get further north. There seems to be some sort of moral there, which probably depends on which end of the country you live at. The moral I draw is that you can find wildlife in the strangest places, and that I should wash the toilet floor more often. There’s more information under the Resources tab on the Butterflies and Moths page. Now I just need to ID the other one! 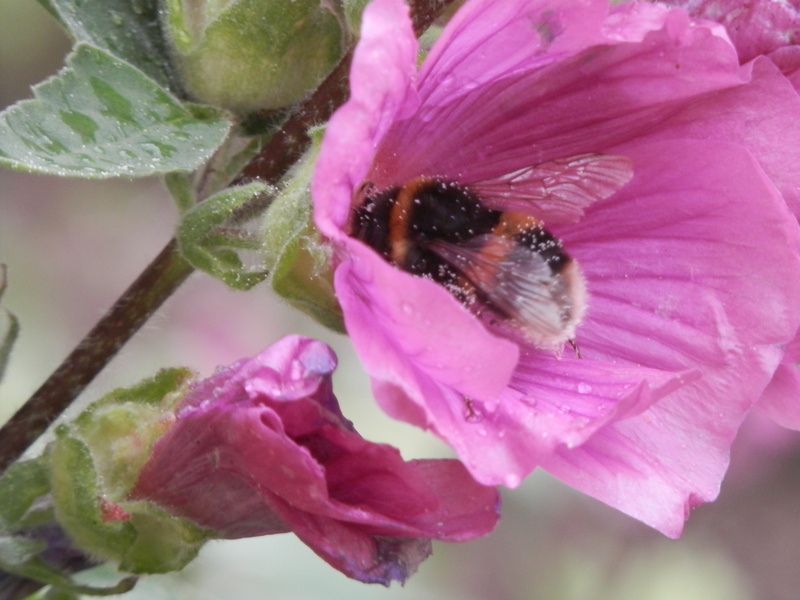 This entry was posted in Environment and tagged bumble bees, pollinators on July 25, 2015 by quercuscommunity. When I looked in the polytunnels just after lunch it sounded like it was raining. The pitter pat of raindrops was actually coming from hover flies in the tunnel flying into the roof in an attempt to get out. I tried to shoo a few out of the open door but they weren’t very cooperative. That was pretty much the only thing I saw of interest as I toured the grounds looking for things to photograph. I need pictures of white butterflies for the butterfly page (see under the Resources tab) but the only ones I can get lack detail (a) because the white doesn’t show up well and (b) because they rarely open their wings when they are feeding. cabbage owners has obviously made them more alert than the Peacock and Small Tortoiseshell. I’ve just taken another walk round but evening is drawing on and there’s not a single butterfly in sight. 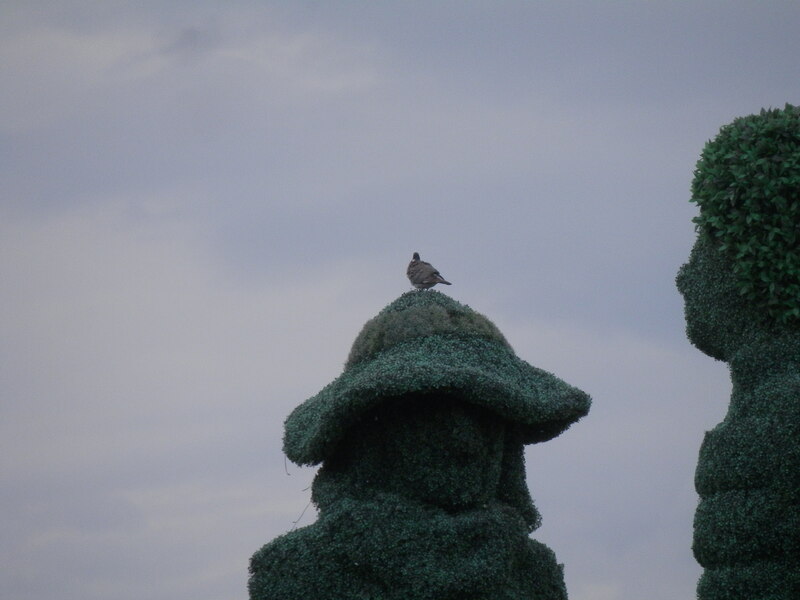 There is a lot of noise from an aeroplane practising aerobatics somewhere above the cloud level and I got a couple of shots of a pigeon perching on one of the statues but there’s very little happening at all. It’s not as if I’m a whirl of activity either, so I can’t really lecture the world for being quiet. Inside I’m buzzing, but in terms of actual work being done I’m not showing to advantage. I have too much to do at the moment and at a time I’d like to have had a day or two to slow down I’ve been given more to do. However, if there’s one thing that’s certain in life it is that things change. It may seem like my head is about to burst at the moment but in a couple of weeks it will be back to empty, so why worry? having written that, I can feel everything falling into place. The mind is indeed a strange thing. This entry was posted in Countryside and tagged butterflies, photography, pigeon, thinking on July 23, 2015 by quercuscommunity.